Sorry, we are unable to accommodate requests for tours of our workshop. 106 Western Avenue is located SW of downtown Essex. 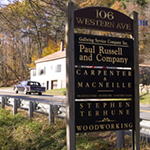 About a mile after turning off Route 133 onto Route 22 or Western Avenue, you will see a sign on your left for Paul Russell and Company. (If you come upon the Essex Building Center on your left, go back.) The entryway passes over a small stream. Our office entrance is around the far right end of the building complex, at the top of a small rise. Our loading dock is located at the far right of the building complex frontage, just before the slight rise. All trucks over 20' should stay on the lower level as there is no turn-around space up the rise. The most convenient access to us is from Logan International Airport in Boston, MA. Drive time from Boston's Logan International Airport is about 1 hour. Alternatively, there is the Manchester-Boston Regional Airport in Manchester, NH. Drive time from Manchester-Boston Regional Airport is about 1.5 hours. Drive time from Boston's Logan International Airport is about 1 hour. Follow signs for Route 1A North, then Route 60 North, then Route 1 North, then I-95 North. From I-95 North take Exit 45 and follow signs for Route 128 North (towards Gloucester). We are located less than 5 miles from Route 128. At Exit 15, turn left at the stop sign, crossing over Rte. 128 heading North towards Essex. Follow School Street/Southern Avenue through the countryside for about 5 minutes. At the stop sign turn left (West) onto Route 133. Drive approximately a half-mile down Main Street (past restaurants and antique shops). Leaving the Village Restaurant on your left, turn left (SW) onto Route 22/Martin Street. Less than a mile along Rte. 22, just after Western Avenue merges in from the right, you will see on your left a sign for 106 Western Avenue/Paul Russell and Company. (If you come upon the Essex Building Center on your left, go back.) The entryway passes over a small stream. Our office entrance is around the far right end of the building complex, at the top of a small rise. 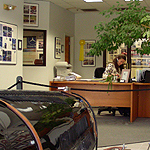 Beverly Airport (BVY), a small regional airport, is a ten-minute drive to our southwest. The Massachusetts Bay Transportation Authority (MBTA) offer Commuter Rail Service from the greater Boston area to our neighboring towns of Hamilton/Wenham, Manchester-by-the-Sea, and Ipswich. Paul Russell and Company is located about 24 miles north of Boston. The town of Essex is a small colonial-era New England seacoast village, renowned for building the great wooden fishing schooners. The main street consist of antique shops and seafood restaurants, surrounded by the Great Marsh. Manchester-by-the-Sea, a picturesque harbor town. Clicking on map will take you to Google Maps. Located in the 1854 Coburn House, offering Japanese fare and New England hospitality in a Federal-style home. Rockport Inn & Suites offers accommodations and amenities to suit vacationers and business travelers alike, on five acres, a short walk from scenic downtown. Cape Ann's only historic grand hotel, this lovely Rockport inn is a historic gem. Thirty-six beautifully appointed rooms have been restored to reflect the quality of yesteryear. Enjoy a great location on Beach Street, directly across from popular Front Beach. Easy walk into Rockport Village. Located on a quiet back street, from where you can walk to a beautiful sandy beach, specialty shops, restaurants, art galleries, and the train to Salem and Boston.